In the podiatry field, or really any field having to do with medicine, we use a lot of fancy, over-complicated words to describe parts of the body and procedures – and believe me, it’s enough to drive ME crazy, let alone my patients. That said, one of these fancy, over-complicated words is arthroscopic ankle surgery. Sure, ankle surgery is pretty straight forward, but what about arthroscopic? And while most people can decipher “scopic” as a scope of some kind, and even “arthro” as a joint of some kind, it still doesn’t really give you the scoop – all patients hear is “surgery,” and fear the worst. Well, I’m here to tell you that arthroscopic ankle surgery is really nothing to be afraid of. It’s a scary, complicated word that basically describes a minimally invasive surgical procedure involving a few tiny incisions – like one centimeter in width tiny – nothing traumatic at all. That said, I perform arthroscopic ankle surgery on my patients to evaluate and treat a variety of pathologies within the ankle joint, including confirming a diagnosis, removing loose boney bodies, shaving bone spurs, debriding excess inflamed synovial (ankle joint) tissue, tendon damage and fixing fractures of the joint surface within the ankle. This very minimally invasive procedure has led to wonderful results for my patients without a lot of downtime or pain. So what exactly does this surgery entail? Using a fiber-optic viewing camera and small surgical tools, small incisions are made to access the ankle joint. 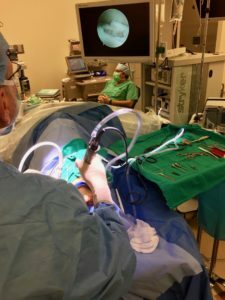 An arthroscope – a small tube with a camera and light – is inserted into one of the incisions to allow me to see exactly what’s going on. Then, the small surgical instruments are inserted into one of the other small incisions to perform what’s needed to make you better. There are many benefits to this type of procedure. 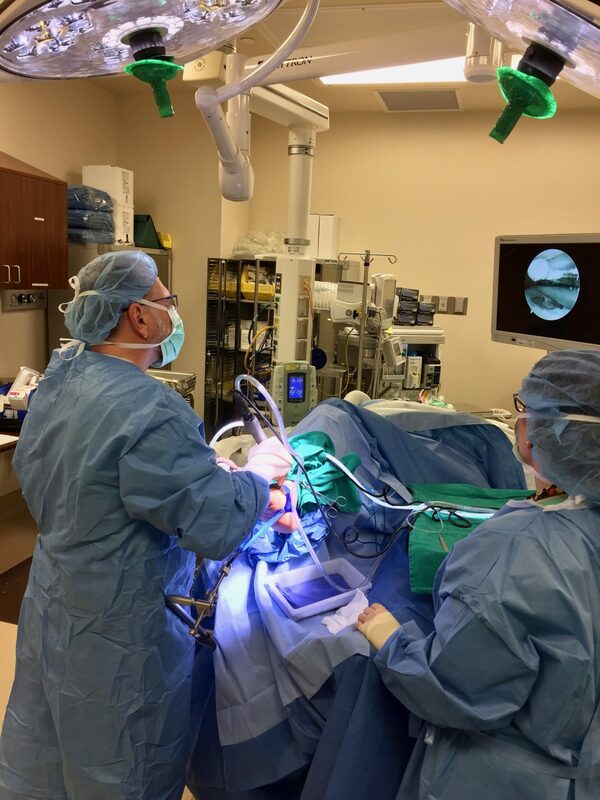 I’ve been doing surgeries for 25 years, and compared to traditional open surgical procedures, arthroscopic surgery does result in very minimal soft tissue disruption and trauma, meaning you probably will heal faster and be on your again, faster. Some other great benefits are that the pain is minimal, there’s a lower rate of infection, you are able to return faster to your every day activities and little scarring occurs. Patients who undergo arthroscopic ankle surgery usually heal in a few weeks. Of course, recovery time is dependent on the extent of the surgery and the individual patient, but generally speaking, a few weeks is all you need. Surgery is performed on an outpatient basis with general anesthesia and patients wake up with their ankle feeling immediately better. So, if you’re experiencing ankle pain that won’t go away or is continually getting worse, give my office a call, today. In this day and age where surgical techniques and technology have evolved so rapidly and effectively, there’s absolutely no excuse to live through pain. I’ll make sure you put your best foot forward, again!